Sometimes you just have to make do. Lobster bisque is great. But not many of us have a bathtub full of lobster ready to give up the ghost to a bowl of soup. So why not substitute surimi for that lobster meat. 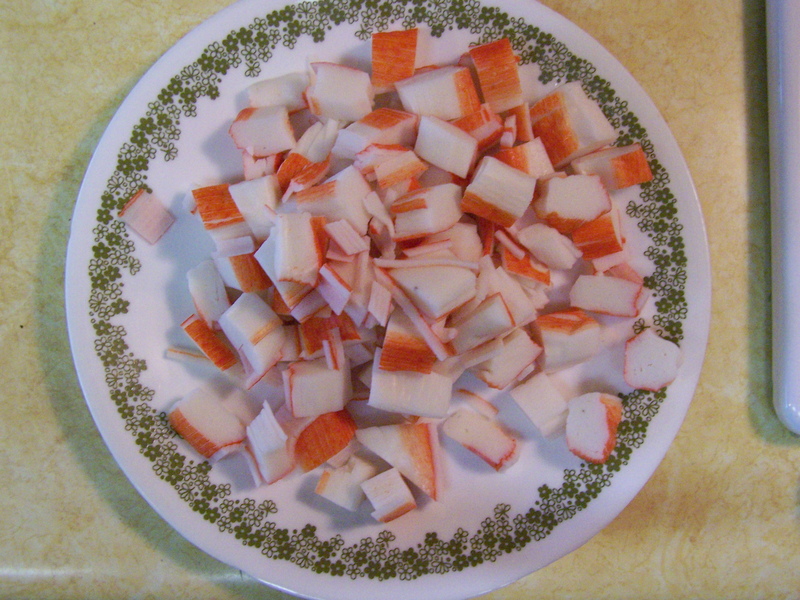 Search the web for surimi bisque recipes (if you can remember surimi is the real name for that artificial “crab” meat you always see around) and you won’t find any. 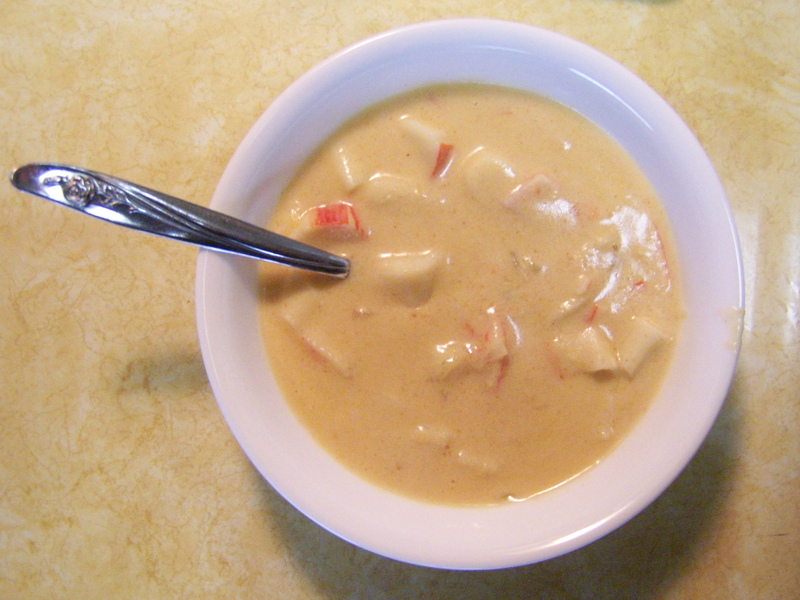 So why not take a blend of crab and lobster bisque recipes, get the flavor of what goes into a lobster bisque and how to put it all together. Most of the bisque recipes call for celery. If you don’t have any, but do have a can of condensed cream of celery soup up in the cupboard (that maybe should’ve been used by two years ago, according to the label) why not use that for celery flavor. And if you don’t have half-and-half or cream to use, well how about using some concentrated milk flavor in the form of evaporated milk (it was next to the celery soup and may have been there longer). And if you don’t want to open a can of tomato paste to get a teaspoon or two out, why not try a little bit of catsup (all cooks take this with a grain of salt, or more) to add some color. And if you’re missing Worcestershire sauce, how about adding a little paprika, both for flavor and some additional color. Margarine for butter? Forget about it. The bisque came out surprisingly good. The texture is extremely good, nice and creamy. The color is a little weak, but not far off. The flavor is mild. I might try adding a small can of real crab meat the next time to bump up the flavor. But for all the compromises, it’s a keeper. And the cupboard’s a little barer. Melt the butter in a 3 to 4 quart sauce pan. 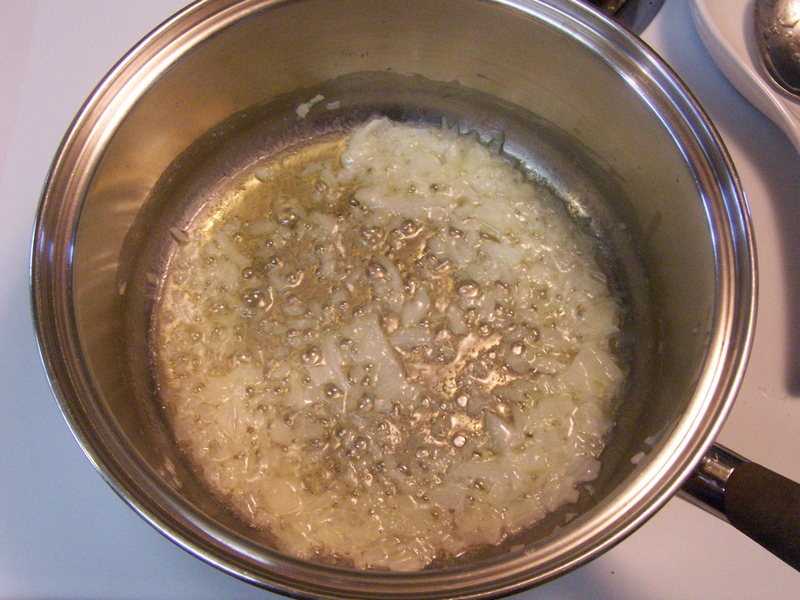 Saute the onions in the butter for about 5 minutes on medium-low heat. Add the flour, mix with butter until an even consistency for about 5 minutes while stirring. Add the cream of celery soup and evaporated milk. Stir to an even consistency. Bring back to almost a boil. Add in the milk. Stir and bring back to a simmer. Add the chicken broth. Stir and bring back to a simmer. Add in the catsup and paprika. Stir. Add in the surimi. Stir and then cover pot for about 3 minutes. Covering brings the soup back to a boil sooner. Lower heat. Cover and simmer about 5 minutes longer to thicken and blend flavors. A note: As the soup has a lot of thickeners in it from the flour and whatever’s in the cream of celery soup, get your spoon down to the bottom of the pot while stirring and scrap the thick stuff off the bottom. That should help clean up. This entry was posted on 07/04/2010 at 16:11 and is filed under Recipes, Recipes, food, cooking and related items. You can follow any responses to this entry through the RSS 2.0 feed. You can leave a response, or trackback from your own site. why would I want to eat surimi? what the hell is that? maybe call the blog the gross recipes nobody wants blog. ugh.